The cryptocurrency markets are currently in the red as most top digital coins are taking a hit, with some dropping over 20% in the last 24-hours. The reason behind the sharp decline at press time remains unknown. The flagship cryptocurrency, Bitcoin (BTC) has declined below the significant $6,000 support on Wednesday and is trading around $5,759 as at 17:00 GMT, after shredding of gains of over 9% in the past 24-hours. The sudden drop in price comes as BTC was becoming unusually stable, with its 30-day volatility index falling to levels it had not seen since December 2016. 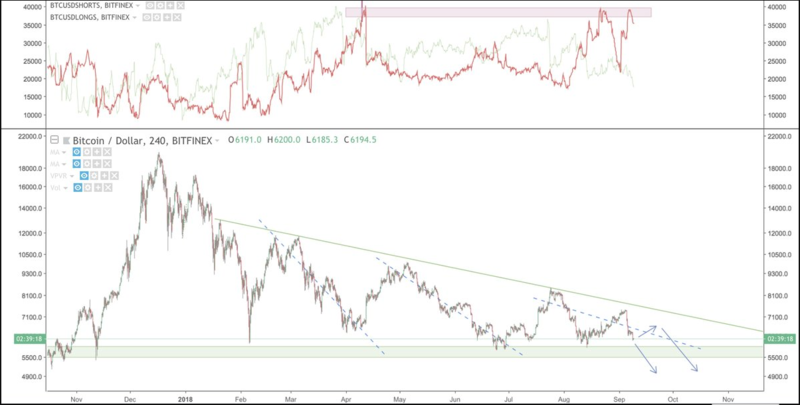 As seen in the chart, the Relative Strength Index (RSI) has also dipped into the oversold region, which could mean the number one digital cryptocurrency may soon bounce back. Its support just below the $6,000 level has been tested several times so far in 2018 and has been able to hold. In the meantime, this downturn has forced the cryptocurrency market capitalization past an uncomfortable milestone today, as it is dropping below the $200 billion mark on the eve of the contentious Bitcoin Cash hard fork. Since no major events seem to have contributed to the latest price declines, with some technical analysts have before today predicted that the ongoing bear market would extend into 2019, a longer period than many had previously expected. Willy Woo, a trader, and technical analyst has shared his prediction that Bitcoin’s bad days are not over yet. He shared his opinion on his official Twitter handle saying that the bearish trend will continue until the second quarter of 2019. Willy backed up his bearish prediction using technical analysis tools. One of them is the NVT signal trendline as you can see in the chart included in the tweet above. 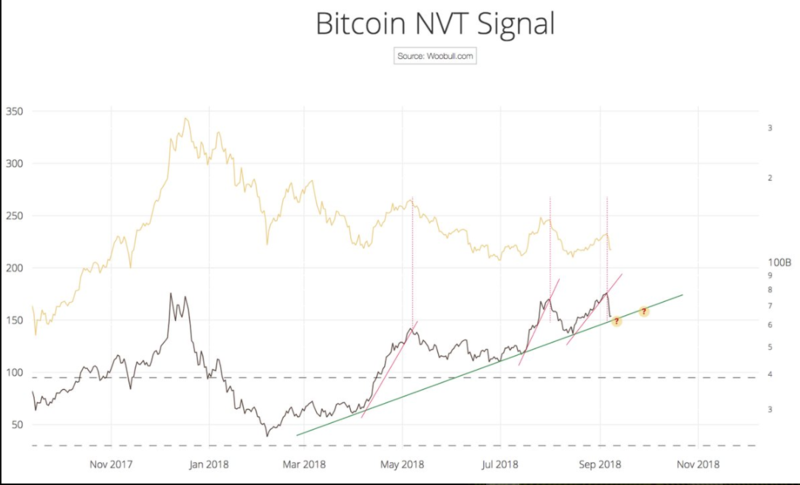 The analyst believes that the NVT signal trendline support is confined and there might be another bounce to the overbought zone before the next break. He also speculated that a break below the NVT support line will likely indicate the next major move down within a day or two. Will also believes short positions are quite close to all-time highs which might provide a reasonable opportunity for the bulls to take small profits as price moves to the top of the range. As the arrows in his chart below indicate, the price is expected to drop below the lower line support of the range subsequently. The OBV is a momentum indicator that uses volume uses volume flow and price to measure the buying and selling pressure of an instrument. Willy believes the OBV is selling off more than what price indicates with a price-OBV bearish divergence across several exchanges and time frames. Moreover, several factors are still in place that could potentially reverse the bearish trend before the end of 2018. Notable figures such as Michael Novogratz and Tom Lee had claimed that a reversal in Bitcoin’s fortunes would be seen by Q2 next year as institutional investors begin interacting with the markets.